Allen Steele’s Coyote trilogy was something of a mild surprise for me. It is not the most literary of science fiction, but that was not Steele’s aim. Presenting a reasonable scenario wherein humanity colonizes another planet with a cast of characters that hover between 2D and 3D experiencing drama that was not off the charts, it makes for enjoyable enough reading within the hard/soft sf field. 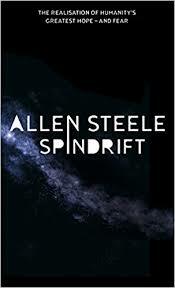 The canvas of the trilogy broad enough to accommodate a variety of spinoffs and even outright continuation of the main storyline, it was likely to no one’s surprise that in 2007 Steele published another novel in the Coyote universe, Spindrift. A frame story, Spindrift opens with three astronauts, Theodore Harker, Emily Collins, and Jared Ramirez, returning unexpectedly to Earth in a strange space vessel after having disappeared fifty years ago on a space mission nobody knew the fate of. The mystery of the fifty-year gap explained in the main story, things begin with the USS Galileo, lead by an incompetent but well connected captain, setting off to investigate a strange alien signal eminating from a BDO, nicknamed Spindrift, in a nearby galaxy. A big secret discovered by Harker, Collins, and Ramirez en route to the BDO—a secret the captain would rather the crew have not known, the open-minded nature of the trip takes a hit, and comes full face upon arrival at Spindrift. Events spiraling out of control, the mystery of the BDO is answered even as the veil of sentient life in the universe is peeled back. Spindrift is a lot rolled into one: first contact, BDO, and hard sf space opera. While the story material is such that it oozes out of the cracks in characterization, Steele manages to keep the lot contained by maintaining a steady focus on the mission. The events and circumstances of Harker, Collins, and Ramirez’s flight to Spindrift, exploration of it, and the aftermath are front and center the entire novel. This story causing me to question events at the end of Coyote Frontier, it nevertheless keeps the attention (at least mine) via good tempo and well-spaced setting/plot reveals, which, when you come right down to it, are the techniques which keep asses in the seats for first contact/BDO/hard sf space opera—that elusive sensawunda. In the end, Spindrift is tried and true science fiction that does nothing more, but, nothing less. The characters are relatively consistent, hovering much closer to 2D than 3D, and the plot arc is nothing the field has not seen before. Steele does unravel the story at a wonderful pace and keeps the suspense up. Where a lot of other sf writers get bogged down in bouts of exposition, Spindrift keeps a steady rhythm, collectedly answering the mystery of what happened to the three astronauts while escalating the urgency of their situation. I would argue Spindrift is only loosely Coyote material (it could have been written in most any sf universe and does not require reading of the original trilogy), but does serve to blow its doors wide open—as the several additional novels in the Coyote universe prove, I guess.